Mobile payments are only expected to grow in prevalence – transforming the way consumers pay both online and offline in the coming years. Stay ahead of the trend and ensure you are collecting payment the fastest, and easiest, way for your clients! 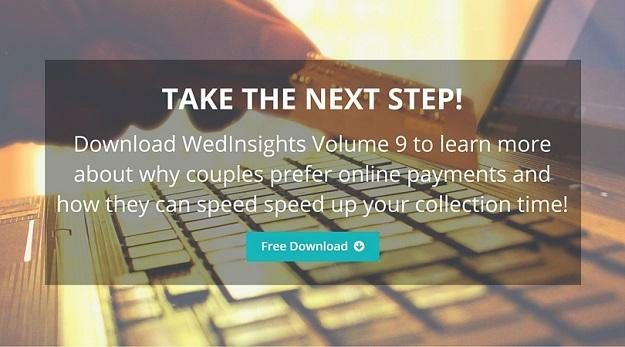 The stats below from Volume 9 of the WeddingWire WedInsights Series shed light on why couples prefer online payments. Although 85% of couples pay for their products or services by personal check, writing a check has become a thing of the past in the minds of today’s couples. Just like you need to stay up-to-date with the latest trends in your field, it’s important to do the same with your business practices so you aren’t perceived as outdated! Submitting a payment online is not only convenient for the client, but it also helps you get paid faster. Couples on average take less than one day to submit an online payment, whereas those required to mail in or drop off a check take 3 – 4 times longer. Why wait? All pros want to make a good impression, and accepting online payments is a step in that direction. Your clients will not only love that you accept online payments, but it will make you easier to work with and as a result they’ll be more likely to recommend your business to others. Choosing to limit your payment types can negatively impact your business more than you think, as our data shows that only 20% of couples are likely to recommend a vendor who only accepts cash. *Of course with any financial decision, you should consult with your trusted experts and consider the ease of account setup, any transaction or other fees, and the security/fraud protection offered with any payment system.